Rock Grind Blade satin finish done by Sebastian with torched backspacer and all bronzed hardware. Anthony Marfione and Sebastijan Berenji have once teamed up for a new custom design that's already proven itself as a hugely popular liner lock folding knife THE STITCH and it's now available in full auto from the Marfione Custom Knives Shop. Each Marfione Custom Auto Stitch's blade is hand ground by Sebastijan and really one look at arrow tip and the super deep sweeping hollow grinds (top and bottom of the blade) and you can see this makers signature style found no where else. This blade was ground by the hands of someone who knows loves steel and has the patience to create some of the deadliest functional art we've seen to date. 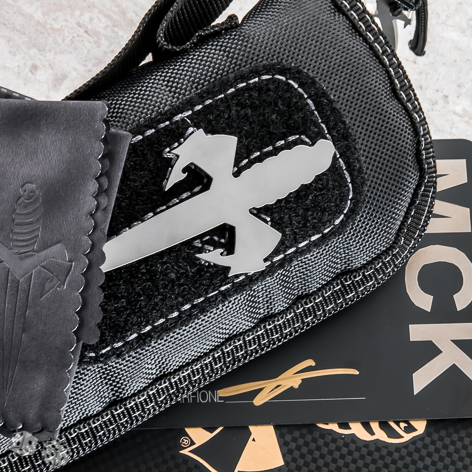 Also includes dual signed certificate of authenticity signed by both makers Anthony Marfione and Sebastian Berenji along with zip up case, Marfione Custom Knives box and cleaning cloth.